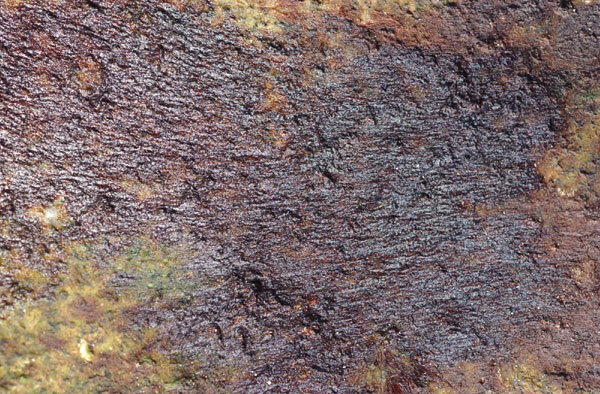 Description: Gelatinous, unbranched, blackish-purple filaments, at first uniseriate later multiseriate, attached by rhizoidal outgrowths from basal and adjacent cells. Cells with central star-shaped rhodoplast with pyrenoid. Habitat: On rock, wood, etc., as fleecy mat, especially at high tide level on exposed coasts in autumn and winter, disappearing in spring or early summer, at other times present as sparse filaments in shade at all levels and subtidally. Widely distributed, seasonally abundant. Site © M.D. Guiry 2000 - 2019. Important copyright notice: all text, design and photographs on this site are copyrighted by M.D. Guiry unless otherwise stated and all rights are strictly reserved. Click here for copyright information and contact. Website design: 249 Design Studio. Site maintained by M.D. Guiry (michael.guiry@nuigalway.ie). There have been 8736696 page loads since 1 January 2014 on 25 April 2019.